PolyNet NG is a programmable icon bar able to display Gif anims, Amiga icons, and also PNG icons. 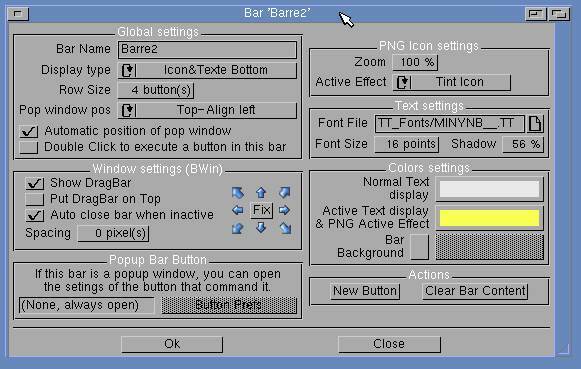 It has a wealth of customizable option like true type support, creation of bars within bars, between many other never seen features in other similar amiga programs. PolyNet NG is a beautifull odd looking beast that unfortunately comes with no manual. It is very hard and unforgiving for newcomers to understand it, so this is my attempt to facilitate that journey. 1.AmigaOS 3.5 or better already installed. 2.Magic User Interface 3.8 (mui 3.8). 3.Either Picasso96 or CyberGraphX, RTG systems. Download THIS archive and follow the instructions that are inside of it. If you choose this path you can now skip the MANUAL INSTALLATION and the HOW TO RUN IT sections. Just jumpt to the MAIN CONCEPTS section. 2.From WBStart.lha only install wbstart.library to your Libs: volume. 3.From pmlib.lha (or any of its other cpu variants) only install popupmenu.library to your Libs: volume. 4.Unpack PolyNetNG_1.31_68k.lha and place the entire drawer in your harddisk to somewhere you would like. 5.Now you will have a drawer named Poly_Net_NG with the program and its complementary files inside it. 6.Unpack PolyNetNG_Common.lha to the exact same place you extracted PolyNetNG_1.31_68k.lha. 7.Move Poly_Net_NG/libs/ttengine.library to your Libs: volume. 8.Move Poly_Net_NG/mui/ the files BWin.mcc, BWin.mcp, GIFAnim.mcc and Guigfx.mcc to where you store your mui custom clasess. Congratulations, now PolyNet NG is ready to run! You can execute it as any other amiga program by double clicking on its icon. This is assuming you have the PolyNetNG is in your Tools drawer. If not, you are welcome to adjust that path to its actual location. You will also need to make sure you have this text file’s icon, set as “Project” type icon with IconX as its default tool. Remember to add the tooltype DONOTWAIT so that it doesnt halt the entire boot process. "Buttons" are the icons on the bar. "Bar" is the area where icons (here we call them buttons) can be placed. 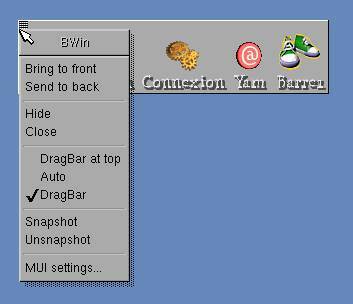 "Dragbar" is the specific area on the bar which looks like a thin greyed dotted strip. "PopBar" is a bar that is inside another bar, and that only pops up when a specific button is clicked. There are 3 configuration menus, some of their items are replicated within them for user convenience. To access any of them you need to first click with the left mouse button the dragbar area. Then depending on the place you click the right mouse button one of the 3 configuration menus will appear. The "BWin" (also known as Window settings) is activated if you click over the dragbar with the right mouse button. This is a pop up menu. The "Main menu" settings is activated if you click in an empty area of your workbench desktop. This is a pull-down menu. The "Bar menu" is activated if you click anywhere in the bar (but not in the dragbar). This is a pop up menu. To create a completely new bar, go to the Main menu and select "Bar" and then "New". A default bar with a trashcan will appear. You can now start to modify this bar to your liking. If however, somehow you regret the idea, you can always click on the trashcan button and the bar will dissapear completely. To Move a bar, click over the dragbar, and drag it to your desire screen location. To fix the new position you have chosen for a bar, access the "BWin" menu and select "Snapshot". To add or remove a button access the "Bar menu" and choose the option you desire. Some drag and drop icon operations are posible when you add or modify a button. To create a bar inside another bar (PopBar), just access the "Bar Menu" from the button that will activate it, and choose "Add PopBar". An empty default bar with a trashcan will appear. You can then modify this PopBar by adding and removing buttons like any normal bar. Remember that everytime after you do any modifications you need to save your work. For this purpose access the Main menu, then go to "Project" and select "Save all". 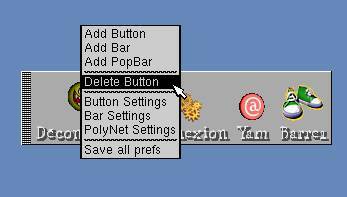 From the Main menu, selecting Bar, the option named PolyNet Settings will appear. Selecting this particular option will allow you to customize any bar. You will see two big pannels. The left panel is for setting arexx modules to make use of the arexx port that particular program may have, and thus access its functions from PolyNet. The right panel has all the bars and popbars available numerically in order to select them for adjusting its settings. As you can see from the picture above, each bar and popbar can have its individual settings modified to suit your needs. You can add any truetype (.TTF) compatible font to that directory to further expand your font availability. Animated gifs look great and provide a kind of animated icon look which is very pleasing esthetically. These files can be often downloaded from websites for free and can be used by PolyNet if they are inside here. You can deeply customize PolyNet if you pick up a text editor and Start tweaking this specific file.